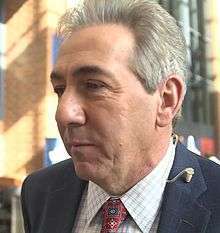 Sal Paolantonio (born June 13, 1956 in Long Island, New York) is a Philadelphia-based bureau reporter for ESPN, who primarily reports on NFL stories. Since joining ESPN in 1995, Paolantonio has become a staple in their NFL coverage, as he contributes to shows such as SportsCenter, NFL Live, Sunday NFL Countdown (from a game site) and Monday Night Countdown (from the Monday Night Football site). In 2004, he added studio work to his duties, replacing Suzy Kolber as the host of NFL Matchup, an X's and O's football show; joining him are Merril Hoge and Ron Jaworski. His best known work for ESPN was his coverage of the Terrell Owens saga with the Philadelphia Eagles during the 2004 and 2005 seasons. Sal has also been an adjunct professor at St. Joseph's University in Philadelphia since 2001. Paolantonio has been a resident of Haddon Township, New Jersey. His given name is Salvatore Anthony Nicholas Paolantonio. ↑ "Sal Paolantonio". ESPN MediaZone. ESPN. Retrieved 29 January 2011. ↑ "ESPN's Sal Paolantonio to Speak at Wilmington University". Wilmington University Public Relations. 27 March 2009. Retrieved 29 January 2011. 1 2 Fazio, Dan. "On The Sidelines with LT. Sal Paolantonio". G.I. Jobs. Retrieved 29 January 2011. ↑ Bracy, Aaron. "Staley's success is no surprise to Leslie", Courier-Post, March 18, 2005. Accessed March 21, 2011. "Sal Paolantonio, a Haddon Township resident, recently signed a four-year contract extension with ESPN."